Professional investors are bombarded on a day to day basis with assertions about the role liquidity is playing and will play in determining prices in the financial markets. Few, if any, of the providers or recipients of such advice can truly claim to understand the well–springs of such liquidity and the transmission mechanisms through which it impacts asset prices. 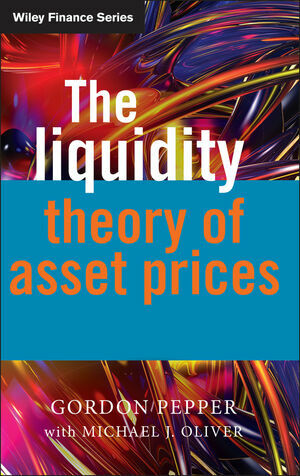 This groundbreaking new book explores the belief that at the core of liquidity there is a force which exerts individuals to effect a financial transaction when they would not otherwise do so. Understanding this force of compulsion is a key to understanding a financial market when it appears to be behaving irrationally. This book will enable new and seasoned investors to develop an understanding of the factors, so that costly mistakes can be avoided without the lesson of experience. Gordon Pepper has the unusual combination of an economics degree from Cambridge and actuarial training. Immediately after he finished taking examinations, he became a dealer on the Floor of the London Stock Exchange. His ‘postgraduate university’ was the market place, where he underwent the harshest of disciplines. Forecasts based on conventional theories were often wrong. The inescapable conclusion was that these theories were either incorrect or incomplete. Pepper was the joint founder of W. Greenwell & Co’s gilt-edged business (that is, the UK government bond business), which arguably became one of the leading bond-advisory businesses in the world, the advice being about both the best investments and the optimum way to execute business. For more than ten years he was the premier analyst in the gilt-edged market and was often described as the guru of that market. He was the principal author of Greenwell’s Monetary Bulletin, which, in the 1970s, became one of the most widely read monetary publications produced in the United Kingdom. Pepper is the author of three books and the co-author of a fourth: Money, Credit and Inflation (1990), Money, Credit and Asset Prices (1994), Inside Thatcher’s Monetarist Revolution (1998), and (with Michael Oliver) Monetarism under Thatcher – Lessons for the Future (2001). He is also chairman of Lombard Street Research Ltd, which is one of the UK’s leading independent firms carrying out investment research and specialising in analysis of money, credit and flows of funds. Summarising, Pepper’s particular strength is the combination of practitioner and academic. Above all, he writes with great authority from his knowledge of what actually happens in the marketplace. Michael J. Oliver is currently Professor of Economics at École Supérieure de Commerce de Rennes and a director of Lombard Street Associates, UK. He graduated in economic history at the University of Leicester and was awarded his PhD in economics and economic history from Manchester Metropolitan University. He has held posts at the universities of the West of England, Leeds, Sunderland and has been a Visiting Professor at Gettysburg College, Pennsylvania and Colby College, Maine. He is the author of several books, including Whatever Happened To Monetarism? Economic Policy-making and Social Learning in the United Kingdom Since 1979 (1997); Exchange Rate Regimes in the Twentieth Century (with Derek Aldcroft, 1998) and Monetarism under Thatcher – Lessons for the Future (with Gordon Pepper, 2001). He has just finished co-editing a book (with Derek Aldcroft) entitled Economic Disaster of the Twentieth Century, which is being published by Edward Elgar in 2006. He has contributed articles to Economic History Review, Twentieth Century British History, Economic Affairs, Contemporary British History, Economic Review and Essays in Economic and Business History.